Moor-Dale coaches were based in Longbenton to the North East of Newcastle. I don’t know if it was a takeover or a merger, but they became Moor-Dale Curtis. The fleet was moved to the much larger Curtis depot in Dudley, a former mining village in Northumberland which about seven miles to the north of Newcastle, they later bought out Rochester and Marshall who were based in Great Whittington Northumberland, all vehicles were painted in Moor-Dale livery, and the Curtis and R&M names were dropped and the company became the More-Dale Group. They are now part of a group which among others includes – Hylton Castle Coaches of Sunderland, Classic Coaches of Annfield Plain, Moor-Dale and Primrose. For may years they did. and to the best of my knowledge still do provide the Newcastle United team coach, by coach I mean the vehicle the players ride in, not the person who shows them how to pretend they’ve been hurt. Apart from a couple of executive vehicle ‘usually Volvo’ the coach fleet was usually made of Plaxton bodied Bedford’s, I don’t know if they were bought or leased, but about a third of the fleet changed every year, and they only seemed to have them for about three years at a time. The livery was very a very patriotic red white and blue, but the layout seemed to change with every new intake of vehicles. Double deck works and school contract vehicles were a different matter. I can remember an ex Southdown Leyland Titan ’Park Royal I think’ the name was changed, but it was never repainted, but generally they were painted red, with blue centre band and blue mudguards. The two seen here are KGU 60, an H30/26R Metro Cammell bodied ex London Transport RTL from 1949; RTL610, and SFC 425; a former City of Oxford H30/26R Weymann bodied AEC Regent III, from 1952 numbered 425, they also had at leas one Ribble Leyland White Lady. One thing I could never understand, more or less on the doorstep, they had the Corporation fleets on Newcastle, South Shields and Sunderland, they also had the NGT group and United, but all their D/D’s seemed to come from well outside the area. Now owned by ARRIVA if part of the same group that owns the others. Curtis was purchased by Northumbria in the late 1980s along with Hunters of Seaton Delaval. 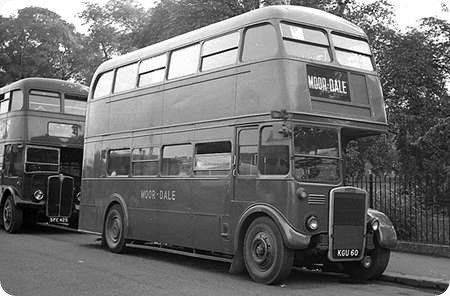 For a time Curtis, Moor-Dale and Hunters buses were kept at the site at Dudley. According to Wikipedia, Moor-Dale was sold back to its original directors at the time Northumbria was bought by British Bus (1994): British Bus eventually merged into Arriva. However the present registered office of Moor-Dale is the same as that of Arriva, so either the company name never in fact left the Northumbria – British Bus – Arriva consolidation chain or in the last 20 years was brought back in. I often used to travel to Newcastle from the Lakes in the 1970s to visit relatives and there were always plenty of Moor-Dale coaches heading in the opposite direction, all of them new as you mention Ronnie. There was also a steady stream of colourful coaches from other North-East operators during the season, especially Beeline (Goldcase Group) and T&WPTE (still branded as Armstrong-Galley) as well as Primrose (Bisset), H E Craiggs, and Priory. The only Moor-dale decker I recall was NFV 316, an ex Blackpool PD2/27, which I saw in Newcastle in 1977. EUF 176; Park Royal? Leyland ??? both Ex Southdown, and both possibly pre war rebodies. Neither were ever repainted in Moor-Dale livery. LUC 355; another 1950 former LT MCW bodied RTL, this was RTL 980. DCK 209; 1950 FCL27/22RD East Lancs bodied Leyland PD2/37. Former Ribble White Lady 1238, I think it was one of a pair. WDC 76; 1959 H33/28R MCW Oron bodied Leyland PD2/37, new to Brighton Corporation.